Franki Elliot, the critically acclaimed author of Piano Rats, has been known for writing typewriter stories on the spot for strangers around the country. The stories will be published in a beautiful, tear-out postcard book called Kiss As Many Women As You Can in October, 2013 by Curbside Splendor Publishing. Monkeybicycle: Piano Rats is a great collection about being young in a city. It reminded me a great deal of ​all the terrible mistakes I made that were so much fun. How does these poems work as a ​snapshot of who you were when you wrote them? Franki Elliot: It’s strange for me to look back on Piano Rats and read it because I feel like different person from when I wrote those stories. I was young, sometimes in love, sometimes heartbroken, and making a lot of mistakes. Which to me, is exactly what your 20s is all about! In my second book, Kiss As Many Women As You Can, the stories are more mature. They are less self-involved and meant to have an overall inspirational message about how we are all connected in life. Mb: ​The poems are unmetered and only follow the loosest of structures, but each one managed ​to capture an emotion for me, usually all in one or two lines. They feel very conversational ​but then surprise you with a real lyricism. How much work goes into the structure of a ​poem? How does its structure inform its content, or vice versa? FE: My writing tends to thrive around one or two good conversational lines. I am always taking note when someone says something that strikes me as a unique or off center. I don’t put any work into structuring the poems, most of them are written in 5-10 minutes. It’s the editing that can make you go crazy tho. Luckily, with Kiss As Many Women As You Can, the poems were written on the spot for strangers so I didn’t have time to worry about format, typos, meter, or structure. All the poems were written in literally 3 minutes while someone stood in front of me watching. They are just thoughts dictated directly through the typewriter. or you know, be a writer. Mb: ​Chicago is the only city mentioned by name in Piano Rats, but you’re based out of LA. ​The poems are very grounded in where they are so I’m wondering where you wrote this ​collection. How did the setting inform the poems? FE: When I was 19, I had a small nervous breakdown and moved to San Francisco on a whim. It seems like a place for a young writer to be. It was exactly where I needed to be at the time. That is where most of the stories take place. A few years later, I ended up in Chicago and that’s when I wrote the rest of them and started piecing them all together. I moved to LA a year ago so I haven’t written much about this city yet! There’s the one she wanted to read to him as he fell asleep. He read it after they ended, alone, recognizing the lines she would love. She always hated the fall. The season and the vertigo. ​Mb: Speaking of Chicago, Curbside Splendor is based there and you have something new ​coming from them in a few months. What can you tell me about your new book? FE: I mentioned it a bit before…I have a postcard book of typewriter poems and artwork coming out. It’s called Kiss As Many Women As You Can, which you will have to read the book to understand where that title comes from! It’s a co-collaboration with an amazing Chicago artist Shawn Stucky. (www.shawnstucky.com). Basically, I got tired of writing about myself, had writer’s block, and began asking people if they would volunteer to let me write a story about them on my typewriter. I was shocked by the response. People I barely knew began asking for stories. Since it is difficult to write a story about someone you barely know, I started asking for topics instead. From there, it became a performance art, where I began taking my typewriter around to various places and writing stories for strangers. I am always surprised by the topics given to me and the strangers are always surprised by what I come up with. I took photos of my favorite stories and put them in the book. Shawn Stucky had designed my first book and cover so it only made sense to get him more involved with the second book. Mb: ​Spontaneous creation seems important to you, which reminds me of Frank O’Hara. What inspires you to write? FE: Other people and their tragedies and small victories in life. It’s what makes us all human. Read more from / about Franki Elliot here. 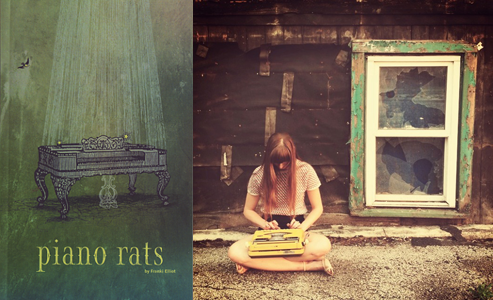 Buy a copy of Piano Rats here.